UM – FIU – MDC STUDENTS STORAGE! 1. Why rent a unit with us? 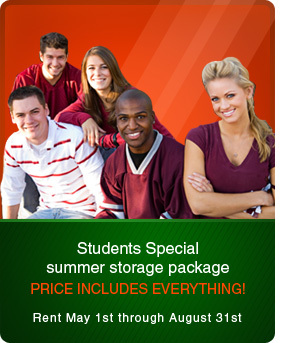 Kendall Xtra Storage has been helping students store their stuff for over 20 years! Having been in the business for so long, we are experts in the self-storage industry and offer a tremendous value. We have over 35 different size units to satisfy any storage need ranging from a few boxes to a multi-room house. As parents ourselves (and once as students too), we understand the importance of trust and reliability. Therefore, we make an extra effort to help customers and treat them as if they were a part of our own family. 1) From the University of Miami. We are about 5 miles south from the University of Miami campus. Take US 1 to 124th Street and turn right. Take 124th street to 87th Avenue and turn left. Take 87th Avenue to 129th TERRACE and turn right. We are half a block down on the left hand side. It shouldn’t take more than 10 minutes to get to us without traffic. Click this link to go to the map page! (Insert hyperlink to map page). 3. How do I decide what size unit I will need? 2) Students who live in the dorms, but want to share or go in on a storage unit together. This category is for students who still live in the dorms and have the typical contents mentioned above, but want to share a unit. This is a great option, just remember you will need a little extra space and that there is a one-time $20 charge (for the entire summer) for each person sharing the unit. For these students we recommend our 4’ x 6’ x 4’ upper, or the 6 x 6 x 4 upper. These units have worked out great for students sharing a unit. Click here to see the video! 3) Students who have some furniture (may just be a futon, mattress, desk, chair, couch, etc.). If you have a piece or two of furniture this category is for you! A unit that is slightly larger, and has a higher height dimension is needed for any furniture. For these students we have the perfect size and recommend a 4’x 4’ x 8’ lower level, or 4’ x 6’ x 8’ lower level. 4) If you don’t fit into any of the above-mentioned categories – this one’s for you! So don’t worry if you’re moving out of a multi bedroom house or apartment – we have over 35 other sizes to satisfy your storage needs. Our goal is to rent you just the right amount of space to satisfy your need without going over! Call or email us direct at (305) 257-8925 / Kendall@XtraStorageCompaniesFL.com and we’ll help you assess the perfect size! 4. What is the reservation process? Once you have your unit size selected all we need from you in order to reserve a unit is your home address, phone number, your credit card information and the size unit you want! We are happy to take this via the phone, fax, or email. Remember, the earlier you reserve the better off you will be. We fill up fast every summer, so reserve early to be guaranteed summer storage! Click this link to fill out and send in your reservation form. As soon as you sign up and reserve a unit you are more than welcome to move in. We highly recommend that you move in as early as you can in order to beat the crowds, and not have to rush. Remember, there is no extra charge for moving in early so feel free to move in prior to school ending in April and May! 6. How do I get my stuff to the storage facility? There are several options to get your stuff to the facility. If you don’t have access to a car or friend’s car consider renting one or using Zipcar (hyperlink). Zipcar has been an extremely popular way for students to get from campus to us. In addition, we are proud to say that we are a Penske (hyperlink) agent and rent a variety of trucks and vans for both one way and local moves. Please check the hyperlinked websites or call us direct for assistance. 7. What do I do when I get to the facility? First check in at the front desk. We will pull up your reservation (or create one for you), and show you to your unit. This video explains the entire process once you arrive to the facility. 8. Do I have to make an appointment to bring my stuff in, access my storage, or move out when I get back into town? No, you do not. Feel free to come anytime during the hours of operation: 9AM-6PM Mon-Sat, 12-6 Sundays. 9. Is there someone to help me (or my daughter / son) lift or move the stuff into the unit? Absolutely! We are more than happy to help! If you have big, bulky, or heavy items just let us know and we will assist you in moving them into the unit. Don’t forget to de-frost, clean, and dry your mini frig! All refrigerators should be stored with the door slightly open in order to prevent molding and increase breathability. Don’t forget to clean your microwave! This is important to prevent molding. Remember to throw away all food and drink prior to arriving to storage. This includes oatmeal packets, cereal, and any boxed food such as rice, or Mac n cheese. We have moving carts, dollies, and a specially designed staircase ladders all of which are here for your convenience. We will show you and explain how to use these if you do not know or if you need help. Remember that we sell all kinds of packing supplies including boxes, tape, rope, and locks!